From the choice as a fallback when he was selected as the CEO of Microsoft, Satya Nadella has generated over $250 billion in market value in just 3 1/2 years since he took office. When Satya was announced as the CEO of Microsoft in early 2014, I made an important decision to focus the Motifworks company strategy solely on the Microsoft Azure cloud platform. 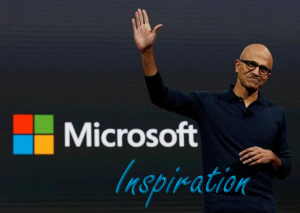 After reading some recent articles and interviews of Satya Nadella on his book release, Hit Refresh, I thought to share my takeaways of his leadership style. When asked in a recent interview whether it is a risk to write a book now, so early in his tenure, Satya Nadella, CEO of Microsoft, said that’s the point. He said “We will have ups and downs. The question is how do we deal with those.” If we are afraid of failing or do not fail, we won’t learn. We should encourage ourselves to fail early so that we succeed sooner. Satya’s 24-year career is exclusive to Microsoft. He shadowed former Microsoft board member, Reed Hastings, CEO of Netflix and accompanied him at Netflix meetings. The important lesson I came away with is, the best learning is achieved through exposure to experiences both internal and external to your organization. One of the main things Satya learned is that Netflix pivots very quickly based on data, which helps them to keep and gain customers. Empathy is essential not only for creating harmony at work but also building products that resonate. Personally, one of the biggest differences I see in Microsoft today is how we can see their innovation align with their mission to enable everyone “to achieve more” in their products. One of the key elements of Satya’s strategy at Microsoft is to bring Microsoft into more open and integrated computing. Microsoft has released 100 iOS apps and even embraced Linux. This strategy is the almost complete opposite of Microsoft earlier philosophy that everything must be on Windows, period. For me, this also relates back to empathy. However, it is as much a business decision as a cultural decision. It is an exciting time for Microsoft and its partners as the go-to-market strategy evolves into helping everyone achieve more. As a Microsoft Gold Cloud Partner with an eye toward the future, we are optimistic that Microsoft’s evolving strategy coupled with Satya’s forward-thinking leadership will prove to be a significant catalyst in driving innovation and growth for the Microsoft partner ecosystem and clients alike.